When it comes to buying used CNC machinery online, there are enough machines to make your head spin. Even if you know exactly what kind of equipment you're looking for (quite a challenge in and of itself), picking a brand, model, and dealer can be daunting. Luckily, Machinery Marketing International's newly revamped site eases that burden with the new design and it's unmatched functionality. While many sites offer tools to help you leaf through their inventories, MMI is the first seller to offer a search feature tailored to your needs, with tools to help anyone from novice to expert find the right machine for your needs. For the veteran who already knows exactly what they're looking for, sifting through dozens of machines that don't fit your function or price needs is a massive pain. 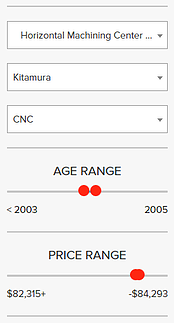 With MMI's smart search feature, you can narrow your results to exactly the machine your looking for, from brand, to price range, to even the age of the equipment. Looking for a used Kitamura CNC Horizontal Machining Center made some time from 2003 to 2005 priced between $82,315 and $84,923? Probably not, but if for some reason you were, you'd be able to find it in a few clicks with smart search. Even if our inventory of hundreds of machines doesn't include what you're looking for, with just a few clicks more you can post a wanted and our team will get to work tracking one down for you. But what if you don't know how old is too old? Or the difference between a used Haas lathe and a used Mazak lathe? Or what a lathe even does? Don't worry, we have as many features to accommodate novices as we do experts. 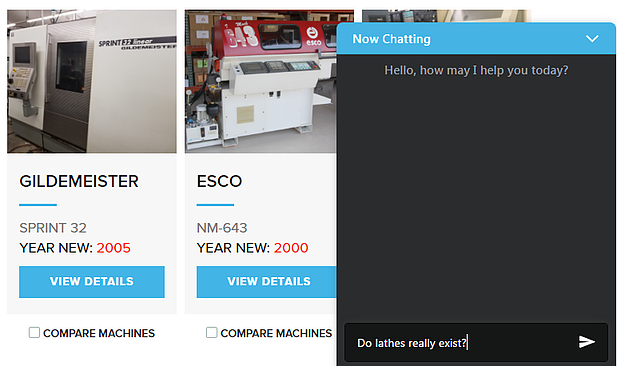 Our blog updates multiple times a week and has a large backlog of articles on how to find the right machine for your needs, but if we don't answer your questions here, you can livechat with one of our many experienced machinists from right on the page. Just click "contact us" in the lower right corner and boom, you're hooked up directly to someone at MMI who can answer any quandary you may have. Once you know what you want and you've found the machine that's right for you, the new shop still offers more features to make your experience smoother. You can get a quote, make an offer, and arrange for financing all from the machine's page. If you set up a free membership, you'll also be able see our special insider pricing. 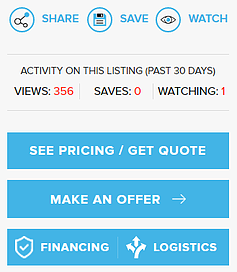 If you can't afford a machine or just aren't ready to make a commitment, you can still keep your eye on it with our save and watch features, and if you'd like to show it to a friend or associate you can do that too with a simple click of the share button. As you can see, we're raising the bar foronline machinery sales, with a streamlined and comprehensive tool to help you find exactly what you're looking for.